A funny thing happened to me at the hair salon several weeks ago. Being late for my appointment set a series of events in motion that still have my head spinning. It was only because I was late that I met the woman who had her appointment after mine. "Judy" turned out to be from Japan, which, of course, caused the conversation to move to origami. Judy, in turn, introduced me to her friend Hisako, who gave me the flower that I featured at a recent workshop. Hisako was excited to introduce me, in turn, to her neighbor Jerry. Jerry is 86 and makes the most wonderful origami boxes and rings. Jerry inspired me to shop for some new books on modular origami and origami boxes, which led me to purchase Fun with Folded Fabric Boxes by Crystal Mills and Arnold Tubis. I read the "About the Authors" section with great interest. The authors met at an origami convention. Besides being origami experts, Dr. Tubis is a physicist and Ms. Mills is a retired high school mathematics teacher. But what really grabbed my attention was the statement that Dr. Tubis was "working on a pilot origami-mathematics project" in California. Using origami to enhance children's interest and skill in math and science is an area I'm interested in, so I began corresponding with Dr. Tubis. I believe we could really use a program like Dramatic Results in the Milwaukee area. As I write this, I'm daunted by the effort of making something like that happen. If you have ideas or want to help, please contact me. In the meantime, I continue to glean as much as I can from the available information and apply the techniques in my workshops. I'm very grateful to Dr. Tubis for all the materials he shared with me, including information about an easy box which I used for the first time in a workshop at a birthday party recently. A couple of young ladies were off doing other things during my session so, later, the young man in the photo at right—a second grader—taught them the box using my techniques, while his mother and I looked on with pride. 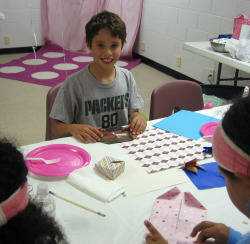 The confidence and focus he exhibited, along with the eagerness of his students, demonstrate the power of origami to benefit children. Best haircut I ever had. The kids at this party had a BLAST! 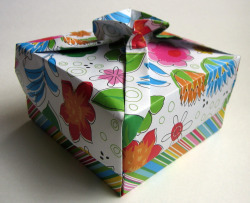 Sign up to be notified of new Origami News articles or find out more.